Barbican is like Marmite – you either love the area on the fringes of the City of London or you hate it. There is no middle ground. For some, it is one big brutal concrete monstrosity that is a blot on the landscape and should never have been built in the way it was. But others say its forward-thinking design has been unfairly criticised and I’ve read quotes from residents saying they wouldn’t want to live anywhere else. Soon after moving to London, I positioned myself in the first camp. The residential tower blocks look grey and boring from a distance. And I remember the first time I walked through the gloomy road tunnel from Barbican Underground station to an event at the arts centre. 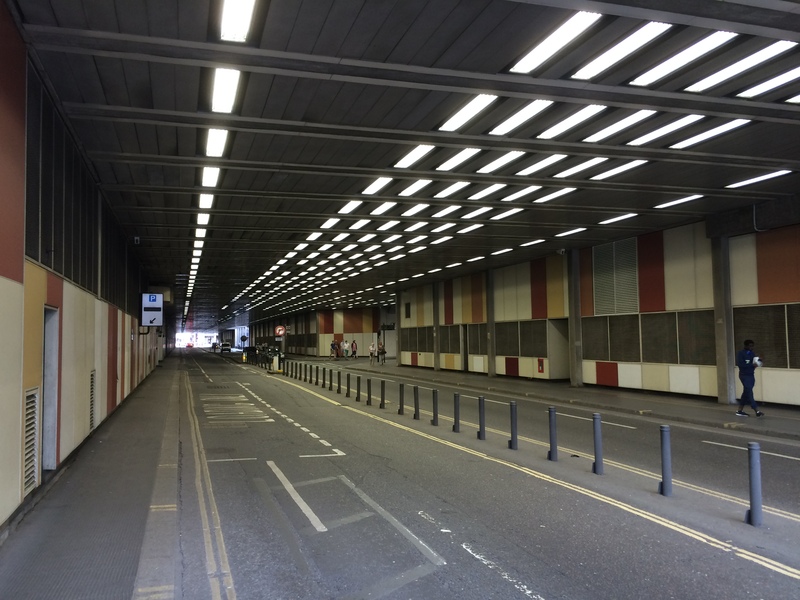 Later, I experienced what I found to be a confusing mess of raised covered walkways (often referred to as “streets in the sky”) that connect homes and an array of public buildings, including the Museum of London. Hadn’t most people in society judged this sort of post war development a mistake? Weren’t these eye sores in other parts of the country being ripped down? But then I spotted a guided walk taking place at the weekend, part of the City of London Festival, which was billed as exploring Barbican’s “impressive urban landscaping” and charting its history. I booked myself a place and went on the tour with an open mind. Our guide Francis Pugh, a Barbican resident of eight years, set the scene by describing how a devastating raid on 29th December 1940 during the Blitz left a “series of ruins” with “just cellars, foundations and nothing much else” bar a church and fire station in Cripplegate ward remaining. The area had been particularly fashionable in the 16th and 17th centuries, when the likes of William Shakespeare and poet John Milton had lived here. After the Second World War, there was much deliberation as to how the vast area – which had consisted of homes, warehouses, including a major parcel yard supplying much of London, and railway sidings – should be re-developed. On one side there were calls for lucrative office buildings to be constructed, while others thought it should be used primarily for homes to encourage people to live in the City again. Financing anything in the post war years and so progress was slow. While what is now Barbican Estate was left, building did start in the 1950s on the Golden Lane Estate to the north. The network of buildings erected here consisting of one and two bedroom apartments were designed to attract key workers. And to this day it still offers social housing (although some were bought by residents through Margaret Thatcher’s right to buy scheme). Great Arthur House was the tallest residential building in London for some time and the development was built with an array of facilities, including a leisure centre with tennis courts and a swimming pool. And even though you are just a few minutes walk from Barbican Underground station, standing in the main square is remarkably peaceful. But the Golden Lane Estate is showing signs of its age, with cladding peeling off some of the residential buildings and there have complained that the City of London has neglected it. Renovation work is however expected to start soon. Whatever your thoughts of the development, it did raise the profile of its architects Chamberlin, Powell & Bon. The Corporation of the City of London then asked the practice to draft plans for what is now Barbican Estate. The eventual Barbican scheme (a number were presented and discussed) created 2,113 flats and maisonettes (accommodating up to 6,500 people – although in 2015 the Barbican Estate’s resident population was said to be over 4,500). Such was the enormity of the project that the Underground line between Barbican and Moorgate stations needed to be re-routed. Construction work began on the residential properties in 1963 and the first tenants moved in to their homes in 1969 (building continued to 1973). 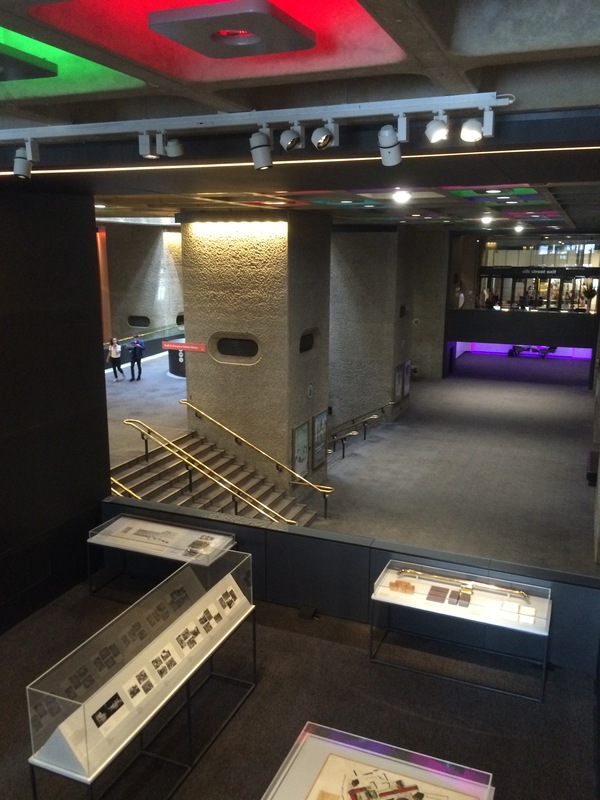 There is a fascinating exhibition in the foyer of the Barbican Centre setting out the story of how the site was developed, bringing together large scale plans and workers’ tools in a number of cabinets. Barbican – which takes its name from a local watchtower demolished by Henry III in 1267 –consists of residential buildings of an array of different heights. But it is the three 44/45 storey high tower blocks that can be seen for miles that dominate the skyline. As you can imagine, the views for many of the residents – which have included Tory minister Norman Tebbit and the former miners’ leader Arthur Scargill – are apparently superb. But going inside the Barbican Estate, I started to appreciate that a lot of thought went into making this a place where the middle classes – distinct from key workers at Golden Lane Estate – would want to live. As a resident, Francis had a key to take us into the private gardens that are an oasis of calm. We went into one with a vast expanse of grass, surrounded by mature forest trees (something that the architects stipulated). People were taking advantage of the good weather by enjoying a book in shade and others were talking with friends. The ornamental lake is particularly attractive close up and residents enjoy exclusive access to sunken gardens – modelled on those in Italy – in the centre. Fountains shooting water up into the air, don’t only create a spectacle but the “white noise” they create help to blot out other less desirable sounds, such as that of traffic on the outlying roads. Rules in the terms of leases help to maintain a pleasant atmosphere. All homes were built with window boxes and residents are expected to look after these. Regular events are apparently held to tell those who aren’t natural gardeners where to get the supplies they need and how to care for flowers. 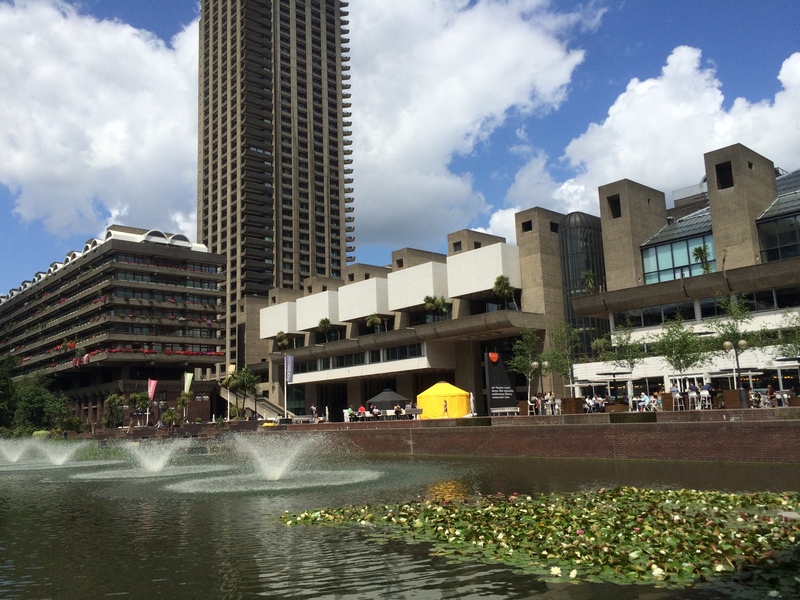 For many people, it is the Barbican Centre that is best known in this “city in the City” (the title of the guided walk I went on). Built between 1971 and 1982, it boasts a theatre, concert hall, cinemas, library, various eateries, galleries and bars. It was in 2003 voted “London’s ugliest building” in 2003. I still maintain that it is gloomy inside and, to me, resembles the interior of a concrete-heavy multi-storey car park that has been haphazardly furnished. But going on the walk with Francis made me appreciate how the architects worked in a very clever way to build such a vast arts centre. By the time the go-ahead to build it was given there was only limited space left, yet ambitions were growing. What has started out as a plan to build a community facility for residents was quickly expanded to developing a major international centre that would be home to the London Symphony Orchestra. The architects dug down, meaning much of the building is underground. Standing on Upper Frobisher Crescent for example you are actually on the roof of the concert hall. And the only reason for the rooftop conservatory (popular for weddings and other functions) is that it hides the fly tower of the theatre. Barbican was originally intended to be visited mainly by people travelling in cars, hence the network of car parks and covered roads in the bowels of the centre. This explains why there isn’t really a main entrance, but numerous doors in from various ramps and walkways dotted around the outskirts. And squeezed into the 35 acre site, besides the arts centre, a range of other non-residential buildings have been constructed over the years, including the City of London School for Girls and the Guildhall School of Music. 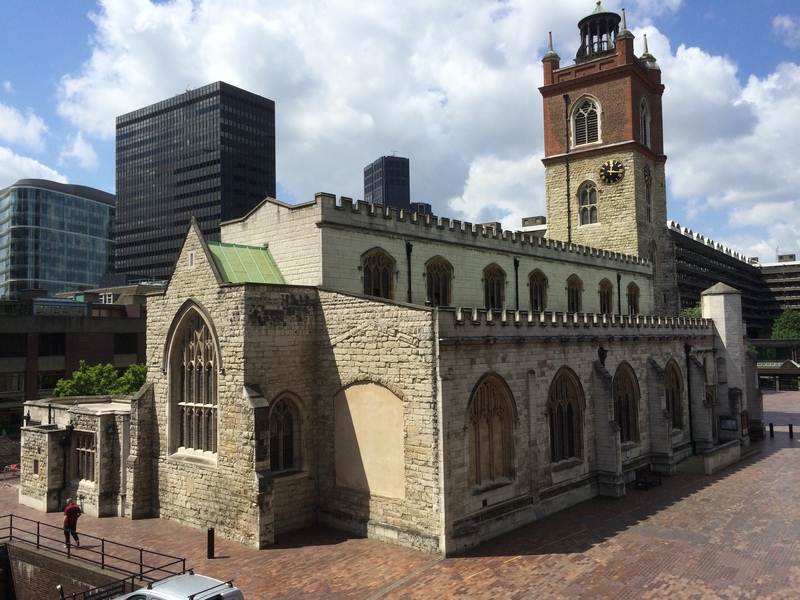 I also think the architects did a good job of incorporating various historical features, such as building a wonderful terrace around St Giles Cripplegate church and putting centre stage a surviving stretch of London’s original City wall, which dates from Roman times. 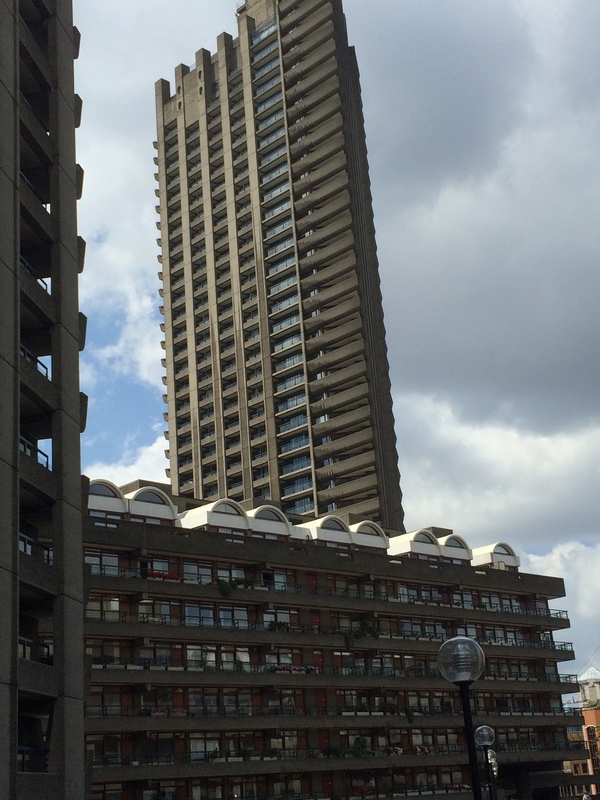 So have I changed my mind about Barbican? I still think that looking from the outside in, it is still a monstrosity. But once inside the complex, you really feel you are miles away from the hustle and bustle of the City. Finishing the walk on the Lakeside Terrace, overlooking the ornamental lake outside the Barbican Centre, felt a pretty special spot to be. The sun was shining and on queue a Rajasthani band in traditional dress, marched out and entertained unsuspecting visitors. Somehow the ugly concrete buildings didn’t make me so angry anymore.